Complete Cloud Phone System: Worth It? Our Guest Post today comes from Michelle Patterson who has been learning and writing about the new IP based communication technologies. She loves sharing her information with the world so that small businesses and business owners can benefit from it. There are many issues that can arise when it comes to setting up a good business communications system. If you are a large or even a medium-sized company, you need to look at the possibilities that are available when it comes to setting up a proper communication network. 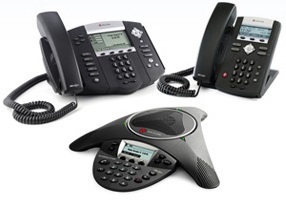 A lot of the time, companies may just choose to take a look at regular telephones that run off traditional lines. A lot of the time, this is a good thing to implement because it can be used even in the likes of an emergency. Of course, there are other issues that can arise with such a system. These include issues like the cost of actually using the system, as well as the installation. What you need to do is make sure that you have a look at cloud-based options and see if they will end up being worthwhile. Cloud telephony has come a long way in the last few years. A lot of people may still be unsure as to what cloud telephones actually are. Essentially, the “cloud” is a special server that is located somewhere and is connected to different computers via the Internet. There is usually space on the cloud that people can rent out. As well as being able to store data on the cloud, it is possible for customers to set up a telephone network using the cloud. This means that the infrastructure for a telephone system is based somewhere else and not in the actual building. It means that you can greatly reduce your costs when it comes to installation. As well as this, you will also be able to access the system no matter where you happen to be. All you need is the ability to connect to the Internet. A good cloud phone system can end up saving you a lot of money when it comes to infrastructural costs. As well as this, you will be able to communicate with your colleagues and your clients even if you happen to be out of the office. All you need to do is make sure that you are connected to the Net. These days, cloud systems can be accessed through the use of handheld devices. This means that your employees will also be able to stay in touch with the office when they happen to be out. For certain types of business, such as e-learning centers, cloud phone systems can be a massive benefit because they will offer the opportunity to teach students over a distance. This means that the company ends up saving a lot of time and money by not having to send their trainers out to different business, or get the students to attend their center. Overall, a cloud phone system is definitely something to consider. Long-distance communication in particular can end up helping you in a lot of ways. If you are looking for something to invest in, then cloud phone systems are something you should really consider.